The Ardhanginni Indian Wedding, Destination and Lifestyle Show took place last month at London's Olympia. When I wrote my pre-event blog post and asked users on twitter whether they would be attending, I got feedback that the ticket prices (£10 for the exhibition and £30 for the fashion show) were a little too expensive, especially when you consider that nobody goes to these type of events on their own, for example a bride-to-be plus two friends who wanted to view the fashion show would end up paying nearly £100. Taking the price into account, I had very high hopes for the fashion show. 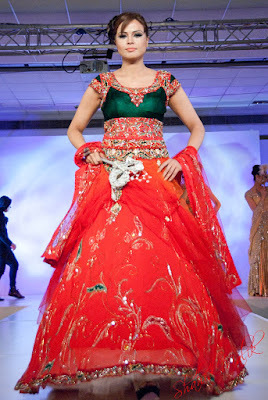 I expected to be blown away by all the beautiful indian bridal outfits and was especially looking forward to seeing the collection by Neeta Lulla who had showcased some beautiful bridals she designed for RCKC at the 2010 Asiana Elite Bride Show. Sadly, this fashion show didn't live up to my expectations. There just weren't enough "bridal" outfits considering this show was billed as an "indian wedding" event. Ironically it was a british-based store, Khubsoorat Collection, which you can find on Green Street in East London, which I thought had the most "bridal" looking outfits. 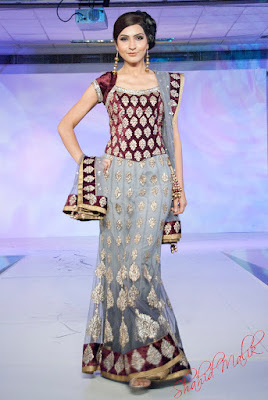 This collection was quite traditional, although it was mostly churidar suits which are great for pre-wedding events but not the big day itself! This was the only lehnga from Nivedita Saboo Couture, the rest of their collection consisted of similar shades of grey/silver matched with other complementing colours. Zooni's collection also included mini-dresses, this was one of the more conservative outfits. This collection had lots of beautiful saris and compared to the other designers at this event, there was definitely more of a bridal feel. As beautiful as these dresses are, they're not what I was expecting at all from this show. 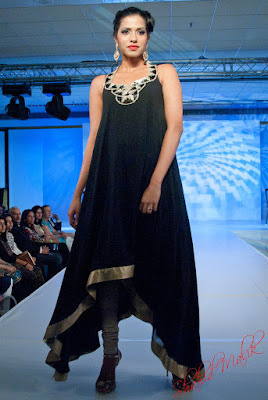 Neeta Lulla had two collections, these mini-dresses and a collection of longer evening gowns. Look out for my next few blog posts covering each designer collection in more detail.